The UAE authorities are willing to make decisions that will meet the requirements of the country’s maritime industry and further foster the sector, said Dr Abdullah Belhaif Al Nuaimi, Minister of Infrastructure Development and the chairman of the Federal Transport Authority for Land and Maritime. 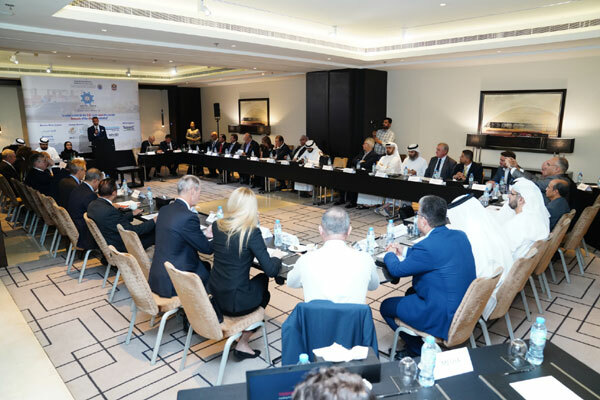 The roundtable, with the theme of “To what extent do the UAE ports meet the current demands of the shipping industry?”, was held under the patronage of the Federal Transport Authority for Land and Maritime (FTA), Tactics Maritime Media and Marasi News. The event brought together prominent UAE maritime leaders from private and government sectors who discussed the status of the UAE maritime industry and the main obstacles that are facing ship-owners and marine services companies in dealing with ports in the UAE and what are the issues hindering raising the UAE flag on the vessels owned by Emirati companies and businessmen. The roundtable’s participants came up with effective solutions that will be presented to the concerned authorities to take the necessary actions in order to drive the UAE’s ports towards innovation and efficiency. “That’s why we have carried on our founding fathers legacy to enhance and develop the UAE’s ports infrastructure to become one of the preferred destinations for ships and shipping lines,” he said. “After that, we have submitted these recommendations to the governments and they have responded immediately by issuing a number of decisions. I would like to take the opportunity and extend deep gratitude and appreciation to our wise leadership for supporting the maritime sector and abolish obstacles facing maritime companies,” he added. The FTA has issued a number of decisions in response to the first Maritime Leaders Roundtable recommendations. These decisions cover a number of aspects, including drafting of a new maritime investment law that is different from the trade law, taking into account the dynamics and specifics of the maritime industry. In June, the FTA joined the Convention of Facilitation of International Maritime Traffic (FAL Convention). This will facilitate all procedures related to maritime investment. Regarding shipowners requests to abolish the requirements of the navigational licensing certificates that significantly hinder ship owners in the UAE and is an obstacle for foreign vessels wishing to enter the UAE territorial waters for maintenance or other services such as marine classification, a decision was made in July stating that a letter from the port is enough instead of prolonged contracts. Regarding the development of the UAE’s ports infrastructure, Geir Fuglerud, maritime area manager, Middle East and Africa (MEA), said: “The UAE ports and marine facilities are known for being advanced which puts the UAE ahead in this field. However, constant development is needed to ensure that UAE keeps its leading position amongst the top countries with advanced ports located on the new Silk Road. “I believe that the UAE should start taking progressive steps to equip its ports and marine facilities with advanced technology needed for several fields; such as conducting and facilitating inspection services by using smart drones in addition to establishing infrastructure for LNG bunkering,” he added. Regarding raising the UAE’s Flag of Convenience on the ships owned by Emirati companies and businessmen, Suha Obaid, deputy CEO, Folk Shipping, said: “Raising the UAE’s Flag of Convenience on the ships owned by Emirati companies and businessmen is considered as a commitment towards raising the UAE’s position and enhance its presence globally based on the size of its fleet.